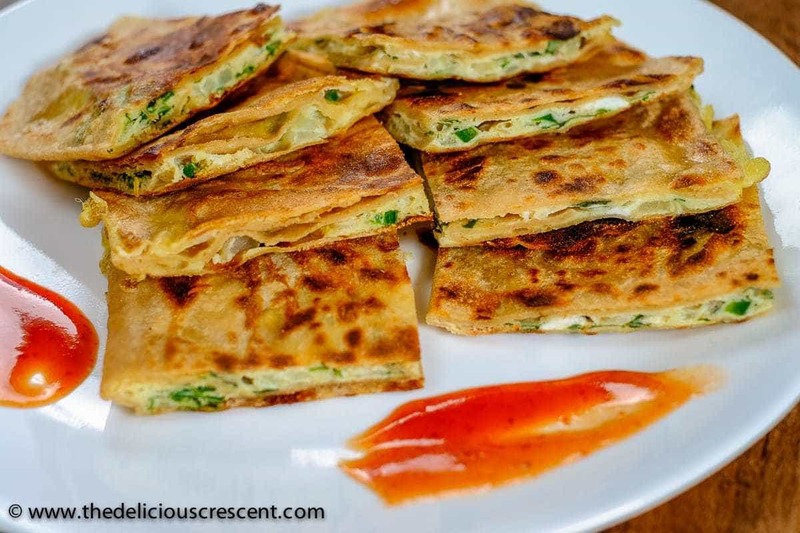 Egg Paratha or anda paratha is a delicious layered flat bread with omelette stuffing. It is an easy and healthy Indian breakfast that is made with whole grain wheat flour and provides high quality protein and good fiber. This popular step by step recipe will make you an expert and your whole family will love these parathas. Who says that a healthy breakfast has to only be a bowl of processed cereal! Traditional breakfasts can also be very healthy. A good choice could be a flatbread such as Spring Onion Paratha served with some Walnut Chutney or Nan-e Barbari with cheese. 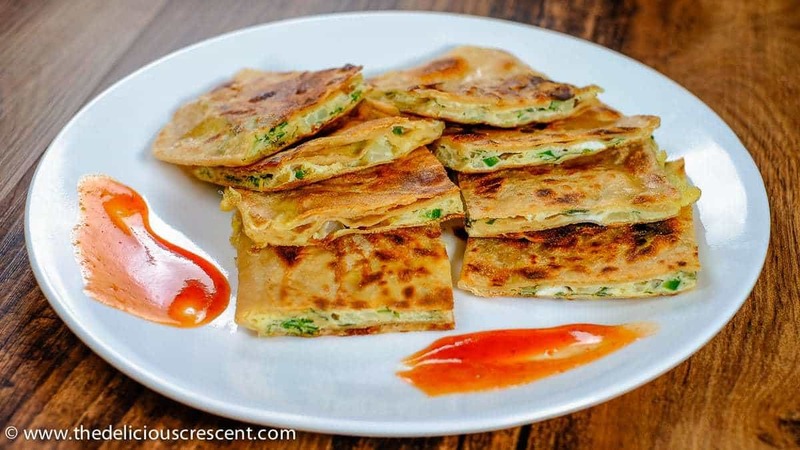 Paratha, is a popular layered flat bread of the Indian subcontinent. It has been a traditional favorite at breakfast in my family. My mom used to make the best parathas – with so many fine layers in the flat bread and just slightly crisp on the outside, while not greasy like the many that I have come to try later. I have seen people prepare these with so much oil or ghee, that this much favored food has ended up earning an unhealthy reputation. Step 1: Whisk the eggs. Add the remaining omelette ingredients, stir and set aside. Step 2: Mix water, flour and salt. Add some oil and knead about 5 minutes into a smooth dough. 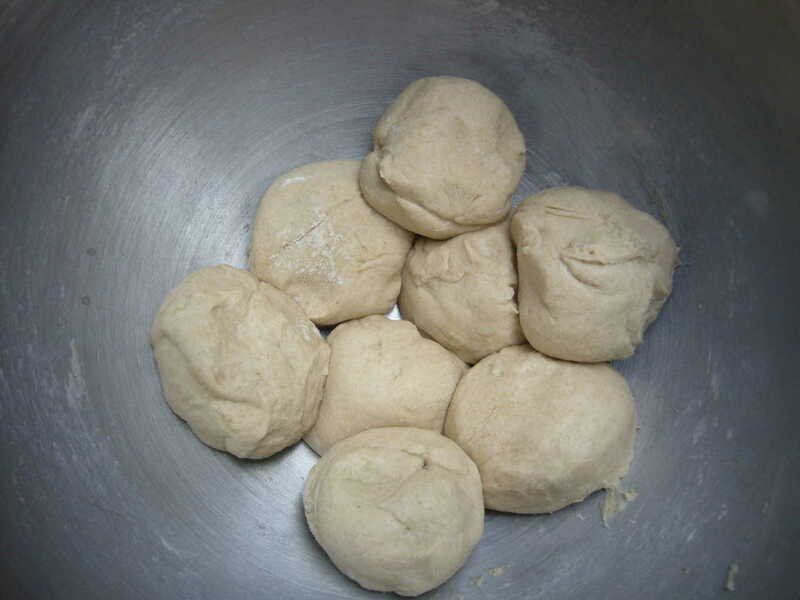 Divide the dough into portions and shape them into round balls. 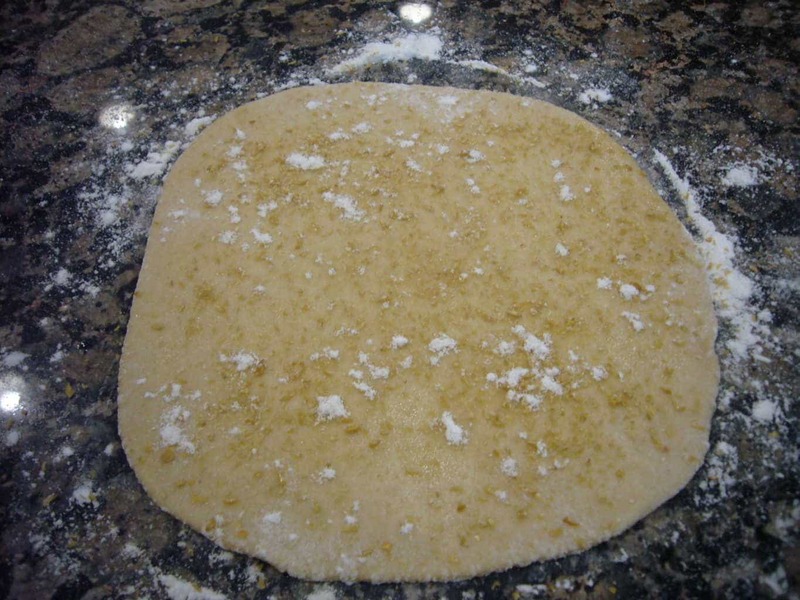 Step 3: Roll a dough ball into a small round or square disc. Apply some oil. Sprinkle flour and if you prefer also some flaxseed meal. Step 4: From one side fold one third of the disc. Step 5: Then from the other side fold over the previously folded layer. 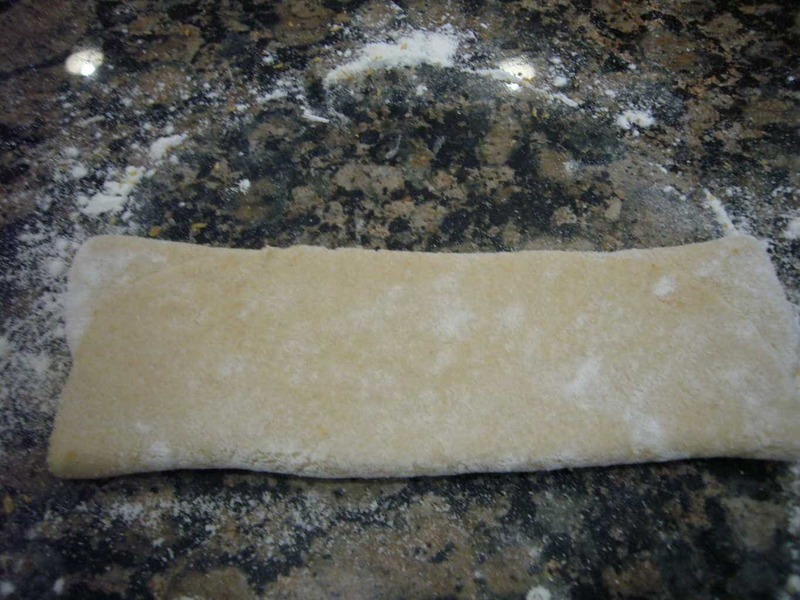 Step 6: Fold one third of this rectangular layered dough from one side. Step 7: Next, fold over from the other side to make a square shaped layered dough portion. 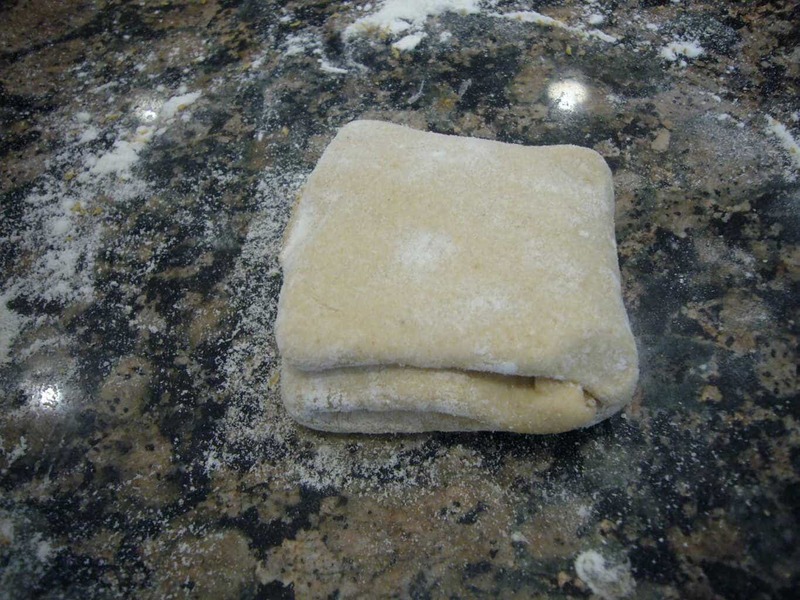 Step 8: Roll it out into a small square layered bread, using as little flour for dusting as needed. Heat a skillet at medium setting. The skillet is ready for cooking when you can feel the heat while holding your palm 3 inches above the skillet. Place the layered flat bread and allow it to cook for about couple minutes. Flip it over and cook another couple minutes until light golden brown. (This stage is very important. Check recipe below). 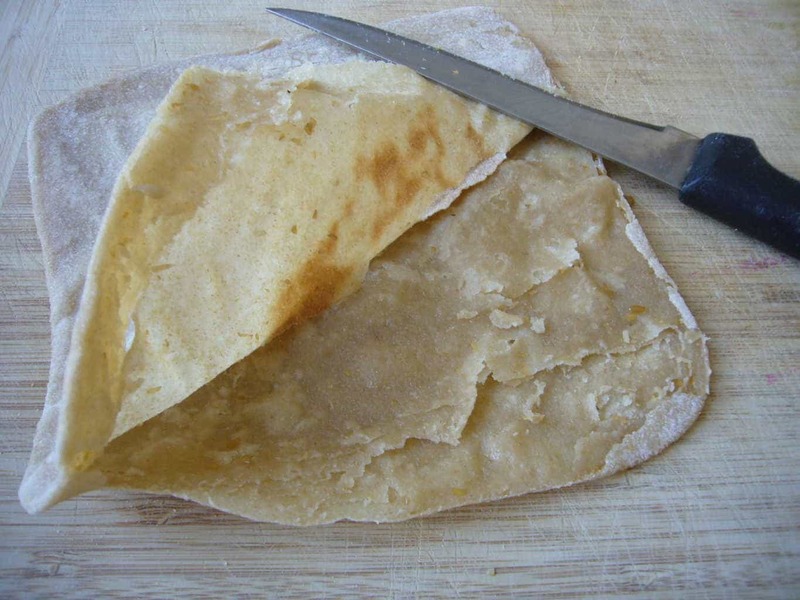 Transfer the paratha to a wooden board and with the help of a knife carefully open up the middle layer on two sides. Step 12: Place the flat bread back on the skillet. Quickly lift the top layer and spread some of the omelette mixture and cover the layer. Step 13: Let it to cook for couple minutes. The omelette mixture should start to set. Step 14: Flip it over. Use some oil for each side while cooking the egg paratha to golden brown. Use a good brand for whole durum wheat flour (atta) with 3 to 4 grams fiber per 1/4th cup. Anything that has 1 to 2 grams does not have optimal fiber content. Chop the vegetables really fine. Heating the skillet optimally is very important. Before adding the omelette mixture, make sure to cook the paratha just enough, so that you will be able to separate the layers easily in the next step. But do not overcook both the sides, otherwise at the end the paratha will be over cooked. Try it a few times and you will get a hang of it! Just as many of my readers and friends have mastered it. 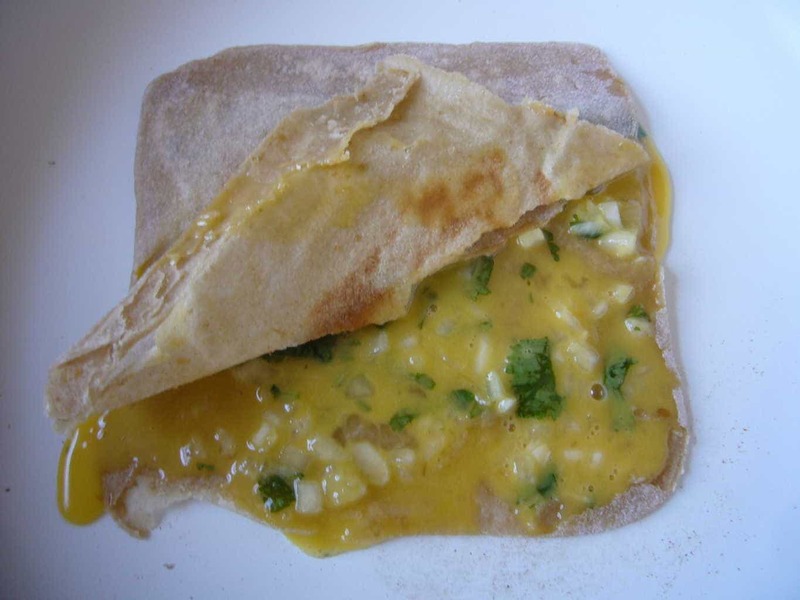 This egg paratha also includes a layer of omelette sandwiched in the middle of the layers. The high quality egg protein, the fiber rich whole grains and adequate healthy fats make this omelette stuffed paratha a wholesome breakfast choice. The amount of carbohydrate is also much lower than what a typical cereal serving would provide at the same caloric intake. So, for those who are watching their carb intake, this may actually fit in better than many processed cereals. For more about the nutrition benefits of eggs checkout this easy and tasty Moroccan style poached eggs. 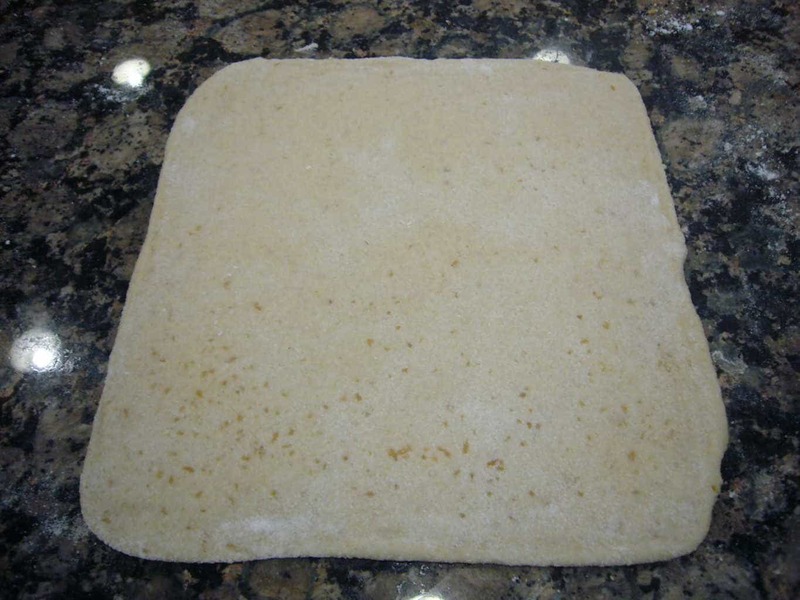 So, here I am presenting a favorite flat bread, prepared with minimal oil but with excellent taste. By the way, this is the first thing that I had started cooking, back when I was eight years old!! Whisk the eggs. Add the remaining omelette ingredients, whisk and set aside. Mix 1/2 cup water, 1 cup flour, 1/4 teaspoons salt. Add 1/2 teaspoon oil and knead about 5 minutes into a smooth dough. 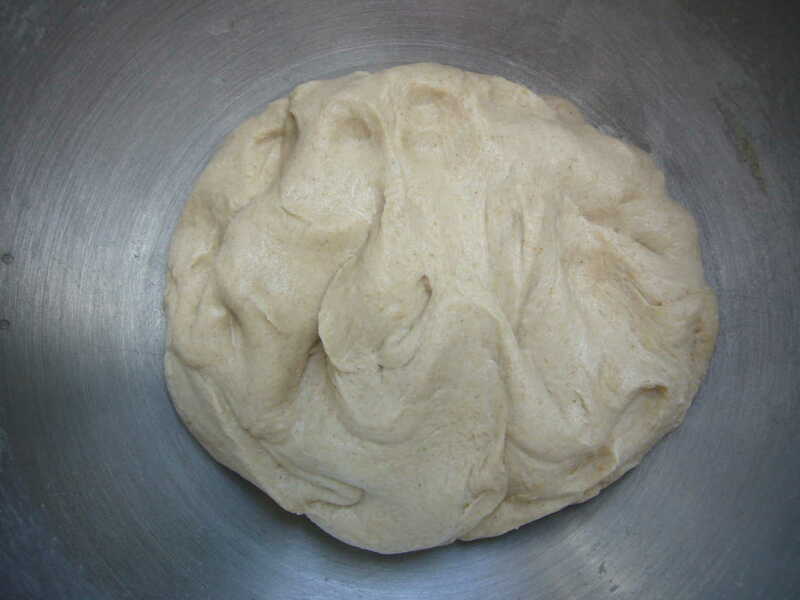 Divide the dough into four portions and shape them into round balls. Roll a dough ball into a 4 to 5 inch round or square disc. Apply 1/3 teaspoon oil. Sprinkle some flour and 1/3 teaspoon flaxseed meal. From one side fold one third of the disc. Then from the other side fold over the previously folded layer. 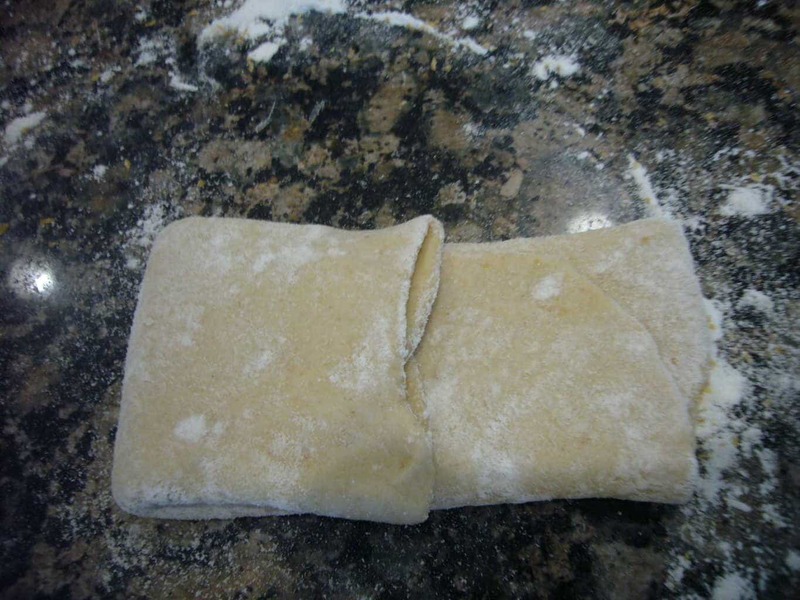 Fold one third of this rectangular layered dough from one side. 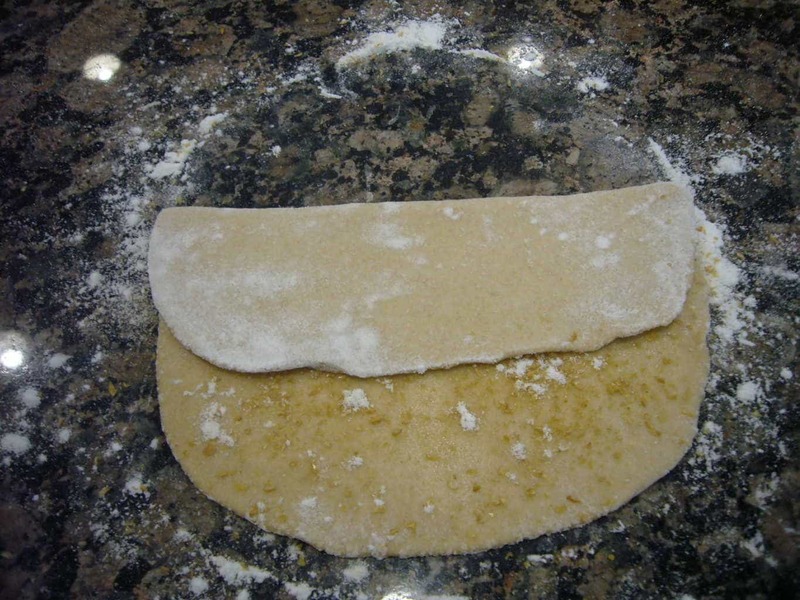 Next, fold over from the other side to make a square shaped layered dough portion. 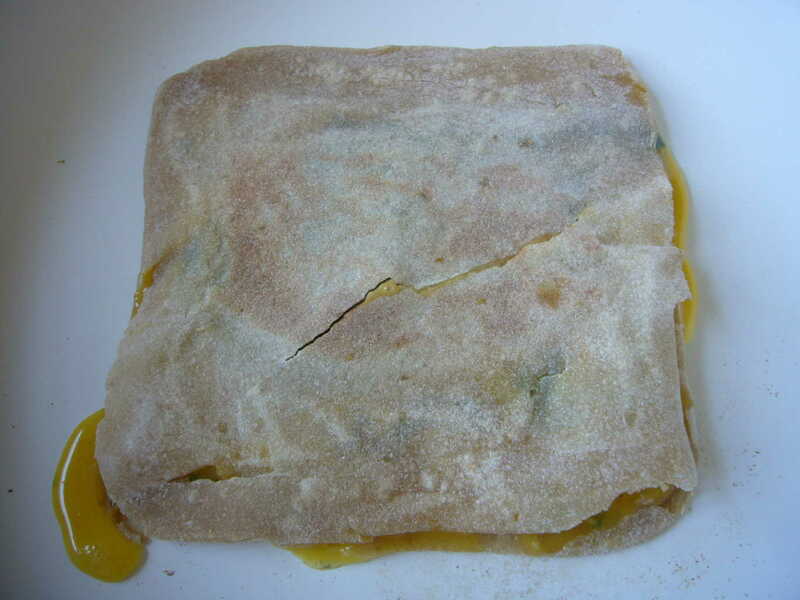 Roll it out into a 6 inch square layered bread, using some flour for dusting as needed. Place the layered flat bread and allow it to cook for about 1 to 2 minutes. Flip it over and cook another 1 to 2 minutes until light golden brown. (TIP: This stage is very important. You have to make sure to cook the paratha just enough, so that you will be able to separate the layers easily in the next step. But at the same time you should not overcook both the sides, otherwise at the end the paratha will be over cooked or over browned). Place the flat bread back on the skillet. 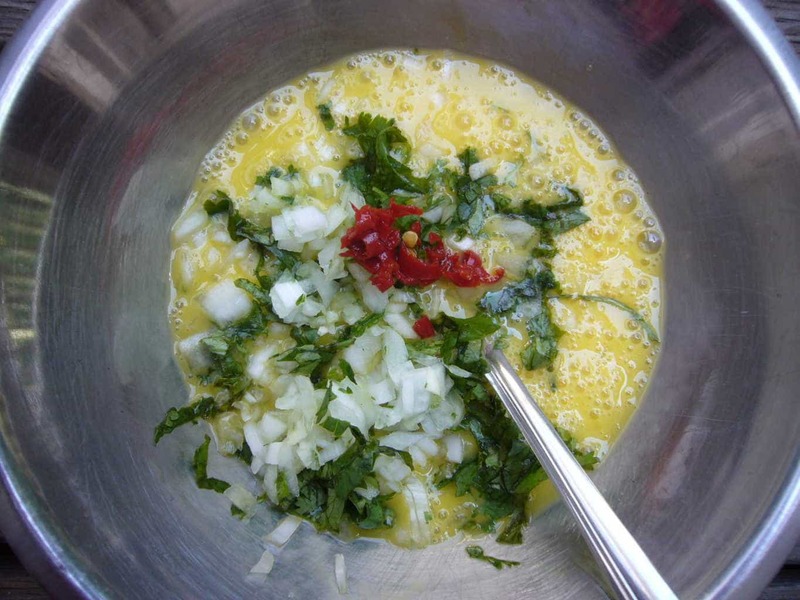 Quickly lift the top layer and spread 1/4th of the omelette mixture and cover the layer. Allow it to cook for 1 to 2 minutes. The omelette mixture should start to set. Flip it over. Use about 1/4 teaspoon of oil for each side while cooking the egg paratha to doneness and until golden brown. Repeat the above steps for the remaining three layered flatbreads. 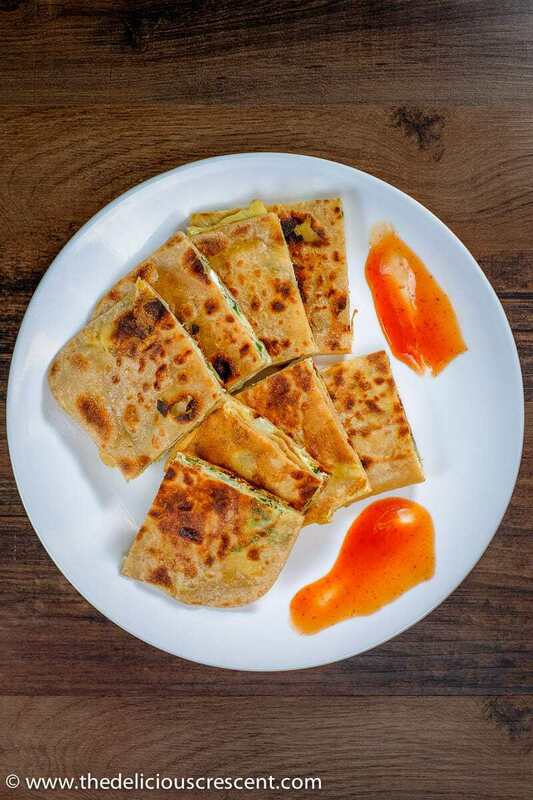 You may serve this egg paratha with chutney, yogurt dip, pickles or ketchup. Choose a good brand for whole durum wheat flour (atta) with 3 to 4 grams fiber per 1/4th cup. Atta (wheat flour) that has 1 to 2 grams does not have optimal fiber content. Do chop the vegetables very fine. Heating the skillet optimally is very important for a good result. 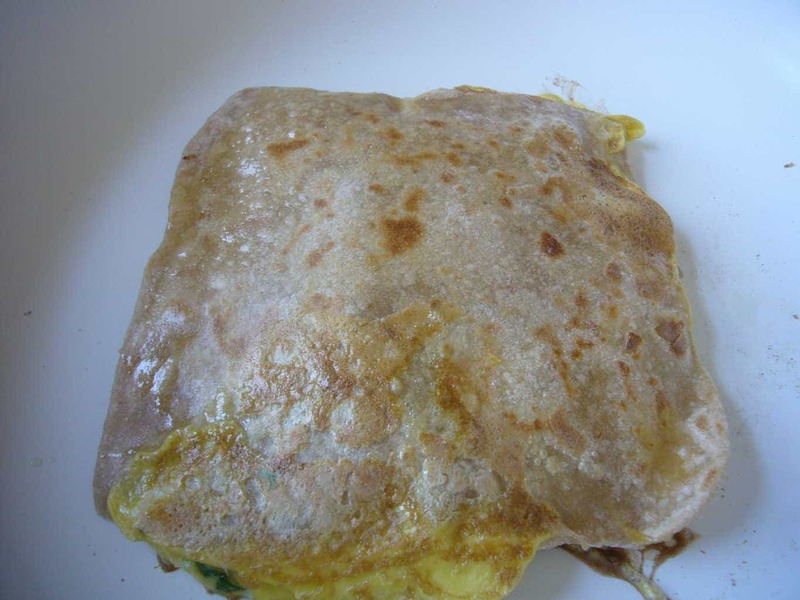 Before adding the omelette mixture, be sure to cook the paratha just enough, such that you are able to separate the layers easily in the next step. But do not overcook both the sides, otherwise at the end the paratha will be over cooked. Give it a try few times and you will get a hang of it! Just as so many others have mastered it. 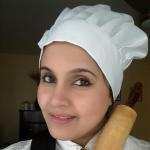 This post was first published on June 14th 2016 and has been updated with improvements in recipe formatting, tips and additional enhancements. These look delectable and the step by step images are a great help. Thanks Lucy. So glad you like it and shared your thought about it. Thanks Sia. I think it tastes great when the egg paratha is in layers. Hope you enjoy it. This looks delicious! I haven’t tried this dish but looks like something I would love. Thank you Brandi. Let me know if you try it. I’ve never tried parathas before, but they look amazing! This is basically my dream omelet, because I get to add carbs. ;) Pinned! Oh wow, like the point you make. Thanks Tracy.